The storm in Netherlands and parts of northern Europe is literally sweeping people off their feet. 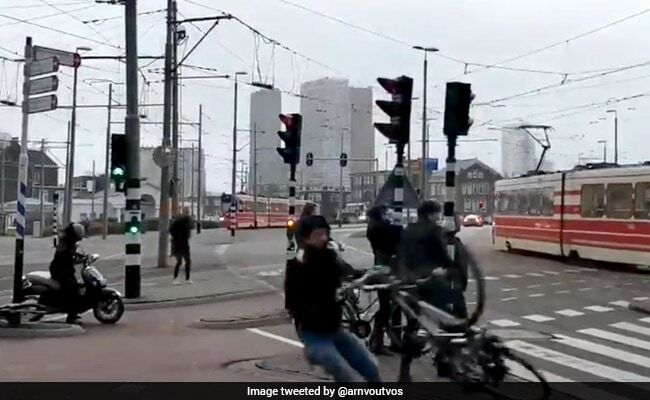 In a startling clip posted on Twitter, a cyclist loses his balance and is blown across a pedestrian crossing, before eventually crashing into a railing. People are seen holding onto traffic poles that are swaying scarily due to the extreme winds. The video was taken in the typically-windy city of The Hague which lies close to the North Sea. Two subsequent videos show people struggling to stay on the ground as they are hit by the wind. As people from Holland took to Twitter with videos depicting the severity of the storm, the hashtag "storm" trended briefly on Twitter in the country. Videos show pedestrians getting dragged across streets, building roofs being blown off, trucks overturning and giant billboards crashing because of the extreme weather. Netherlands and parts of northern Europe are witnessing a severe storm which has caused extensive damage and affected train and air traffic in the region. All flights at Amsterdam's Schipol Airport were briefly cancelled because of the storm. A code red, the country's highest level weather alert, was sounded off by the national weather service on Thursday. Gusts of up to 140 km per hour took the lives of three people in Netherlands as it uprooted trees and damaged buildings. Two people were crushed by falling trees as strong winds barrelled off the North Sea to hit the low-lying country. In Germany, six deaths were reported as violent winds battered northern Europe.